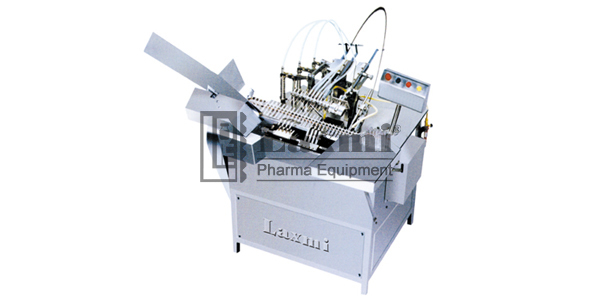 Laxmi Pharma Equipment offers compact Automatic High Speed Four Head Ampoule Filling & Sealing Machine, LAFS-100. The machine consist of The unit built on S. S. Square pipe frame and totally S. S. Coverings, finish, Further, the large opening available at the bottom side for ease of absolute cleaning. The pendant type electrical control panel is lifted form machine for easy of operation and safety. Self centering grippers for the transport of all ampoule diameters within the size range without the need to change. “Drip free adjustment for media of different viscosity. “No ampoule No filling & Selling system”. Full accessibility allows easy maintenance. Individual micro metric adjustment of syringes. POWER REQUIRED OVERALL 0.5 HP. 0.75 H.P. 1 H.P. 1.5 H.P. And in other allied industries too.